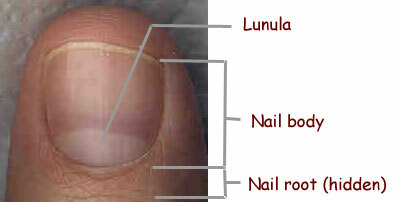 Nail disorder in the lunula – Blue nail moons: a.k.a. ‘Azur lunulae’! How to recognize ‘blue lunulae’? A blue (purple) lunula is characterized by a bluish color of the nail moon (notice: the nail moon usually has a ‘whitish’ color). In general blue nail moons are an indiation for circulatory problems (cold weather may be a part of the cause), or a lack of oxygen (smoking and/or obesity might play a role in this!). If the condition persists, it would be wise to consult the opinion of a doctor – for, even though this is a clinical sign of a simple condition, the cause can actuallly be more severe as well. Do you have a lunula nail disorder? • The FINGERNAIL TUTOR: an online nail disorder identification tool! • 20 Common nail disorders! • More reports about nail disorders! • More hand & fingernail facts!